On July 1, 2017, at 9:40 a.m., an elderly female victim was robbed and severely beaten in the 5000 block of Second Avenue. The suspect, Black male, 6’1”, 220-240 lbs, stole a large amount of cash and property from the victim. The victim sustained multiple serious injuries from being beaten by the suspect and was transported to a local hospital. The victim is expected to recover from her injuries. 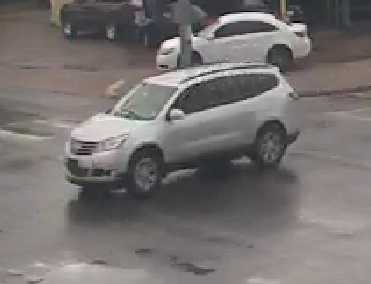 The suspect vehicle is a silver newer model Chevrolet Traverse SUV, with dark tint, no front plate, and a temporary paper plate. Detectives are working to determine if multiple suspects may have been involved. Anyone that recognizes this vehicle, the suspect(s) , or has information on this offense is asked to call Detective Mulvihill at (214) 671-3705. If you wish to remain anonymous you may call Crime Stoppers at (214) 373-TIPS (8477).